I have a new favorite frying pan, cast iron. I know, a cast iron is nothing new but it is to me. I had one years ago but didn't like the fact that you shouldn't use soap to clean it and I could never get those bits and pieces off of the pan and it never seemed clean. I wanted to try again so I purchased a Lodge Cast Iron Skillet from Amazon on sale for only $13.39. 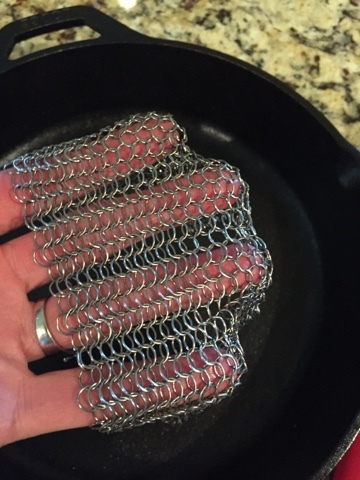 I was also looking on how to clean cast iron and came across this chain link looking cleaner. It's called the Ringer and cost $16.95. I love it! It cleans all the bits and pieces and the pan is clean. 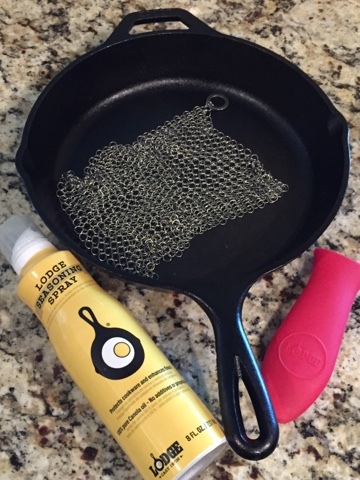 I also bought the Lodge oil spray which I spray the pan to season after each cleaning. I'm now a lover of cast iron for so many reasons. It can withstand heat high heat which is perfect for foods that needs to be seared, and creates a beautiful browning effect. It can be used both on the stove top and in the oven. It's also affordable and will last a lifetime. It really has become my go to fry pan. Here is the recipe that inspired this purchase, Prosciutto Wrapped Stuffed Chicken Breasts from Chrissy Teigen's Cookbook, Cravings. The chicken is stuffed with goat cheese, cream cheese, garlic, thyme and bacon. It's wrapped in prosciutto and then baked with cherry tomatoes. What happens is the cherry tomatoes burst and the goat cheese mixture oozes out in the pan making a delicious sauce to spoon all over the chicken. It's delicious!! 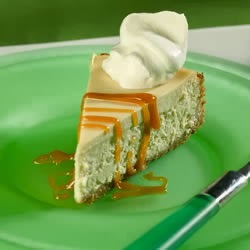 In a small food processor or hand mixer combine the cream cheese. goat cheese, garlic and thyme. Season lightly with salt and pepper. In a medium cast-iron skillet, cook the bacon over medium heat until crispy, about 8 minutes. Transfer the bacon to paper towels. Pour off excess fat from the skillet, leaving enough to coat the pan. Let the skillet cool. Place one piece of chicken between the two sheets of plastic wrap, then use a meat mallet to pound the chicken into an even 1/2 inch thickness. Season with salt and pepper (lightly season as the prosciutto is already salty). Repeat with the second piece of the chicken. Spread each breast with half of the herb cheese. (This will seem like a lot of cheese but it will ooze out and make a sauce so use it all) Crumble the bacon over the cheese and roll up each chicken breast, starting from the shorter side. Then wrap each roll in prosciutto to cover. Brush each roll with olive oil and season lightly with pepper. Place the chicken in the skillet, seam side down, then scatter the tomatoes around the chicken. Throw the thyme sprigs (if using) and bake until the chicken is cooked and some edges of the prosciutto are a little crispy, about 30 - 40 minutes. Let the chicken cool for a few minutes, then slice each roll in half and make sure to include the tomatoes & juices on the plate. This is how I clean my cast iron skillet...only using water I scrub any dried on food with the ringer. Next, dry with a paper towel. When your pan is completely dry, simply wipe it down with oil using a paper towel. Now the pan will be ready to go for next time!